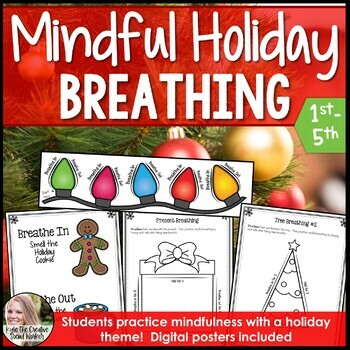 These exercises are perfect for introducing mindful breathing, a seasonal twist on a calm down corner, or changing up techniques to keep student interest! 5 of these exercises utilize tracing and 1 focuses on imagery. Use in individual, group, or classroom settings. 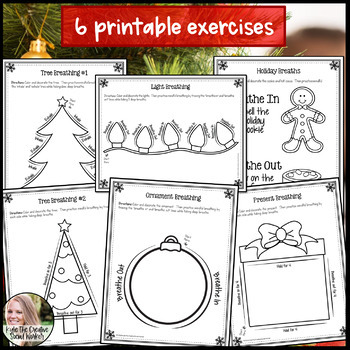 Print exercises individually or as a workbook ( if using in a classroom setting with 1st grade, use of all pages is not recommended). All clipart included is originally hand-drawn. I hope you enjoy this product as much as I do! Copyright © Kylie The Creative Social Worker. All rights reserved by author. This product is to be used by the original downloader only. Copying for more than one teacher, classroom, department, school, or school system is prohibited. This product may not be distributed or displayed digitally for public view. Failure to comply is a copyright infringement and a violation of the Digital Millennium Copyright Act (DMCA). Clipart and elements found in this PDF are copyrighted and cannot be extracted and used outside of this file without permission or license. Intended for classroom and personal use ONLY. Simply refer friends, co-workers, and colleagues back to this product page to purchase themselves. See product file for clip-art and font credits. I offer multiple licensed discounts if interested! When you purchase a product on Teachers Pay Teachers, you can earn credits to spend on future products. Simply come back to the product page after downloading (found under your "My Purchases" tab), and rate the product below the product description. I love to hear your feedback, and make sure I am providing the very best material for you to use with your students.